Happy Metal New Year to everyone! 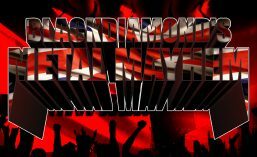 The first Blackdiamond’s Metal Mayhem of 2019 is on Tuesday 8th January at the usual time of 6PM GMT on http://www.totalrock.com. The show will be featuring many tracks from forthcoming albums or the latest singles by bands such as NAILED TO OBSCURITY, DREAM THEATER, THE THREE TREMORS, ALTITUDES & ATTITUDE, BACKSTABBER, CONTRARIAN, AENIMUS, OF ALLIES, LEGION OF THE DAMNED, RIPTIDE, MASTER’S CALL, WUX and more! The META(L)SCOPE will be highlighting three tracks from NWOBHM band MILLENNIUM‘s album from 2017, “Awakening”. This entry was posted in Radio Shows and tagged 2019, Blackdiamond's Metal Mayhem, META(L)SCOPE, MILLENNIUM, TotalRock. Bookmark the permalink.